SCIO (1823): (Locally Pronounced "Sigh--o").Before getting its final name it was called Bloods Corner or Bloods and then later Riddleville, unknown as to where these came from. 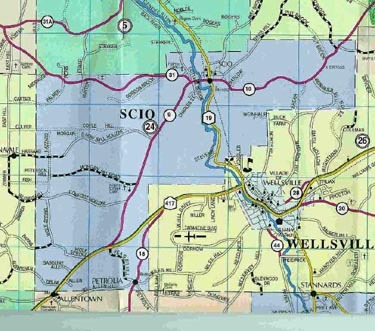 Of all the place name origins in our County, Scio has probably generated the greatest amount of controversy and interest. The most commonly held belief is based on the construction of the Erie Railroad through the county from 1849-1851. Construction of the line apparently was done by section with the area in this part of the county called “section 10” on maps/blueprints of the time. 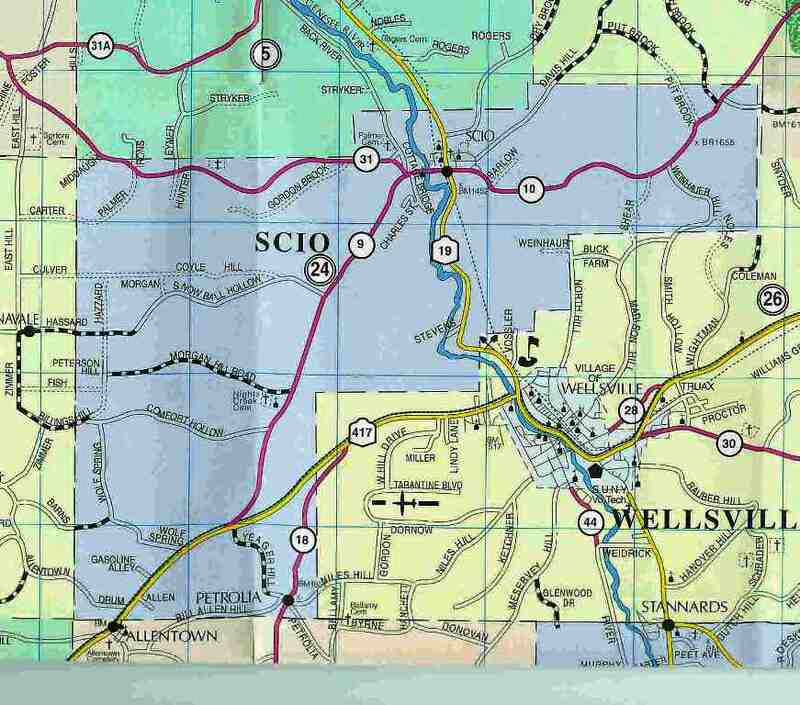 Some believe this area was abbreviated to Sc.10 and the corruption of “Scio” resulted. However, common sense and historical knowledge dictate otherwise. The town of Scio was formed-by that name in 1823, many years before the railroad was even planned. In 1820 there was a massacre of Christians by the Turks on the Greek island of Scio in the Aegean Sea. This act horrified many in the western world with the great Daniel Webster giving a passionate speech that swept the country. The founding fathers so honored the victims by naming their new town Scio. Formed from Angelica January 31, 1823.